This article is about the kingdom. For the city, see Sentinel. The Kingdom of Sentinel is located in northwestern Hammerfell, on the shores of the Iliac Bay. Its capital is the city of Sentinel. Before the Redguards arrived from Yokuda, the elves and manmer established an outpost at what is now Sentinel in order to protect fisherfolk and seafaring merchants from inland Orcs and other hazards in the desert. Little did they know that the greatest threat would come by sea. After the Ra Gada first landed in Hegathe, the warrior-sailors of the Grandee Yaghoub sailed north until they rounded Cape Shira, becoming the first of the Ra Gada to discover Iliac Bay. Yaghoub decided to make his home there. As they sailed "toward the Steed at dawning of the seventeenth of Second Seed", a watchman spotted a suitable harborage, and Yaghoub declared they would build a city there, calling it Sentinel after the watchman. They quickly discovered and established control over the locals' port with little if any opposition. Yaghoub conscripted the locals to serve as masons and servants in the building of his new palace, Samaruik, and the rest of the city. Samaruik, also called Sentinel Palace, remains the oldest and largest architectural achievement in the city, and several additions have been built onto it over the years. When the Crowns followed the Forebears into Hammerfell, they considered Sentinel a "worthy seat", and many of the Na-Totambu settled there (but the city has always been considered a Forebear stronghold, though that term wouldn't be in use until the days of the Second Empire). Of course, the people of Sentinel still had their share of setbacks. They had to adapt to life as merchants. Once, Peregrine Direnni drove an entire Ra Gada flotilla back to Sentinel by using her prodigious sorcery to manipulate the waves of the Iliac Bay. Like the rest of the Iliac Bay, they also faced the devastation brought by the Thrassian Plague, the War of Righteousness, and an invasion from Akavir. The banner of Grandee Yaghoub, the crescent moon, became the banner of Sentinel. The seventeenth of Second Seed became the day of an annual celebration known as Koomu Alezer'i Yaghoub, during which the "faithful" citizens of Sentinel shared pomegranates in honor of the esteemed founder of the city. Scholars say the modern Koomu Alezer'i holiday, an annual harvest celebration the people of Sentinel hold on the eleventh of Last Seed, began as a springtide holiday, and it's possible the two celebrations are linked. Sentinel served as a base for the Redguards' battles against the Bretons, and their influence over the Iliac Bay region expanded from there. The Orcs have been another historical enemy; the people of Sentinel have fought them and participated in campaigns against them since the First Era. An alliance between Daggerfall and the newly-established Sentinel led to the successful Siege of Orsinium, a grueling thirty-year campaign which ended in 1E 980. Despite periods of camaraderie like this, Daggerfall and Sentinel have been in fierce economic competition with each other throughout history, and it has often led to bloodshed between these "ancient enemies". Sentinel and the surrounding area have long been notorious for widespread, underground necromancy. In the sixth century of the Second Era, under the reign of King Fahara'jad, Sentinel came under the threat of attack from an undead army. The army was vanquished, though, in what the king asserted was a divine intervention. King Fahara'jad's daughter, Princess Maraya, married King Emeric of Wayrest in 2E 566, which resulted in Ranser's War (as Ranser, the king of Shornhelm, felt his daughter had been slighted). Fahara'jad soon led Sentinel to Daggerfall's aid in order to help protect his daughter's new kingdom. This alliance soon evolved into the second Daggerfall Covenant. During the Imperial Interregnum, control of Hammerfell reverted to the hereditary monarchy of the Na-Totambu. To the chagrin of the Forebears, the new High King boldly moved his throne from the old capital Hegathe to the more prosperous Sentinel. By this time, Sentinel had mastered a third of the trade in the entire Iliac Bay. Upon the death of High King Thassad II in 2E 862, the Forebears retook their city by force. The vengeful Crown Prince A'tor set sail to the city to avenge his father, resulting in one of the bloodiest massacres in Tamrielic history. When Tiber Septim swept in and reestablished Cyrodilic control over the province, it was seen as a humanitarian intervention. When the Camoran Usurper began his bloody crusade north through western Tamriel, Sentinel and the other Iliac Bay kingdoms were slow to respond even as the threat moved closer and closer to their territory. Historians have attributed this slothful response in part to the fact that Sentinel's ruler at the time was a child. However, the kingdom eventually banded together with its neighbors and helped end the threat to Tamriel. The War of Betony (better known as the Siege of Betony to the citizens of Sentinel) circa 3E 402 was fought between Daggerfall under King Lysandus and Sentinel under King Camaron over the island of Betony, which is in the Iliac Bay nearby both nations. Sentinel attempted to claim it as a vassalage based on an agreement from two hundred years before. Though it was short, the war proved to be bloody and embittering. Bretons and Redguards had often been at odds since the days of the Ra Gada, but the animosity between them became even greater following the conflict. Sentinel ultimately surrendered following the climactic Battle of Cryngaine Field, relinquishing its claim to the island. The subsequent marriage between King Gothryd of Daggerfall and Queen Aubk-i of Sentinel formed the basis for a fragile peace despite this mutual hatred, though many in Sentinel viewed Daggerfall's new queen as an unwilling hostage. Sentinel's naval capabilities were heavily criticized following the conflict. This was apparently one of many conflicts which erupted in the region following the end of the Imperial Simulacrum in 3E 399. Despite this defeat, Sentinel continued to flourish, and it was renowned at the time as the place to go to earn some quick gold or find a bit of adventure. 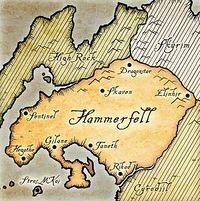 Hammerfell was controlled from the city's throne. An unsuccessful assassination attempt on the life of Queen Akorithi was widely attributed to jealous Daggerfall royalty, though this was never proven. Before the Warp in the West, the kingdom bordered Ayasofya to the east, Antiphyllos to the southeast, and Myrkwasa and the vast Alik'r Desert to the south. The uninhabited isle of Cybiades lay off the coast to the north. Sentinel gained more territory than any other Iliac Bay power from the Warp in the West of 3E 417; the forces of Queen Akorithi ended up controlling the entirety of the northern coast of Hammerfell along the Iliac Bay with the exception of Mournoth. This incontrovertibly made the ruler of Sentinel one of the most powerful individuals in all of Tamriel, and Sentinel became one of the "well-ordered and peaceful modern counties" of the region. The success of Sentinel and similarly-fortunate kingdoms in the area is attributed to the kingdoms gaining control of Numidium — somehow, all at the exact same time. King Lhotun, Akorithi's son, put a great deal of effort into solidifying Sentinel's control over this new territory, using military, diplomatic, and even religious efforts in his attempt to foster peace among his Crown and Forebear subjects. Sentinel became the epicenter for his Lhotunic movement. Animosity between the Crowns and Forebears was sometimes so great that the factions have been known to leave each other to their own fates during foreign invasions. But in 4E 173, when the Crown city Hegathe found itself besieged during the Great War by the seemingly unstoppable forces of the Aldmeri Dominion, a Forebear army from Sentinel came to their aid and broke the siege. This led to the reconciliation of the two factions. In TES II: Daggerfall, the knights of the Order of the Candle are the official protectors of the realm. 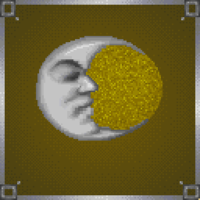 They replaced the Knights of the Moon. The Knights of Iron are also found primarily in and around Sentinel. In Daggerfall, the Selenu clan is the predominant vampire bloodline in the region. The Oracle is a witch who appeared in Daggerfall as a counselor to the monarchs of Sentinel, a position she had held for an unknown, but extensive, amount of time. Among other things, she counseled against entering into the disastrous War of Betony. The Madness of Pelagius erroneously states that Pelagius Septim III was King of Sentinel. He was actually the ruler of Solitude. For game-specific information, see the Daggerfall article, as well as the ESO article on the city of Sentinel. This page was last modified on 9 November 2018, at 12:31.